"Carbon fiber composites fail catastrophically, so you won't see damage until the entire structure has failed," said Chris Bowland, a Wigner Fellow at the Department of Energy's Oak Ridge National Laboratory. "By knowing what's going on within the composite, you can better judge its health and know if there is damage that needs to be repaired." Recently, Bowland and Amit Naskar, leader of ORNL's Carbon and Composites Group, invented a roll-to-roll process to coat electrically conductive carbon fibers with semiconducting silicon carbide nanoparticles. This nanomaterial-embedded composite is stronger than other fiber-reinforced composites and imbued with a new capability—the ability to monitor its own structural health. If the composite is strained, the connectivity of the coated fibers is disrupted and the electrical resistance in the material changes. 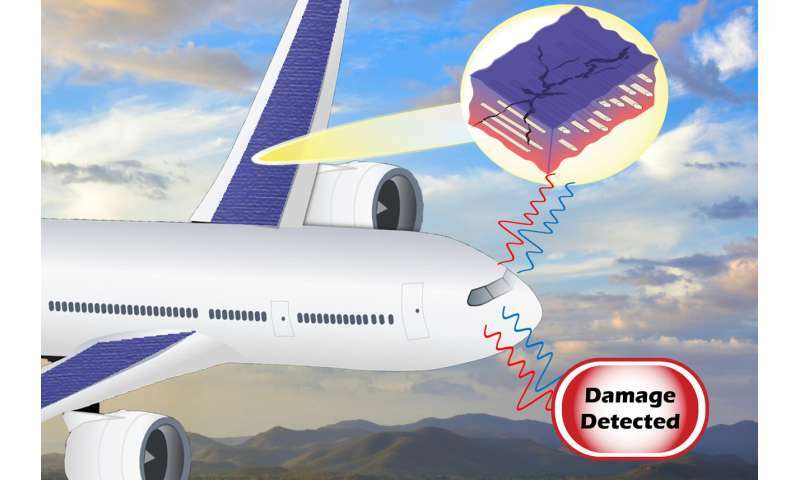 Should storm turbulence cause a composite airplane wing to flex, an electrical signal may warn the plane's computer that the wing has endured excessive stress and prompt a recommendation for an inspection. ORNL's roll-to-roll demonstration proved in principle that the method could be scaled up for high-volume production of coated fibers for next-generation composites. Self-sensing composites, perhaps made with a renewable polymer matrix and low-cost carbon fibers, could find themselves in ubiquitous products, even including 3-D-printed vehicles and buildings. To test the strength with which nanoparticle-embedded fibers adhered to the polymer matrix, the researchers made fiber-reinforced composite beams with the fibers aligned in one direction. Bowland conducted stress tests in which both ends of this cantilever were fixed while a machine assessing mechanical performance pushed on the beam's middle until it failed. To investigate the sensing capabilities of the composite, he affixed electrodes on both sides of the cantilever. In a machine called a "dynamic mechanical analyzer," he clamped one end to hold the cantilever stationary. The machine applied force at the other end to flex the beam while Bowland monitored the change in electrical resistance. 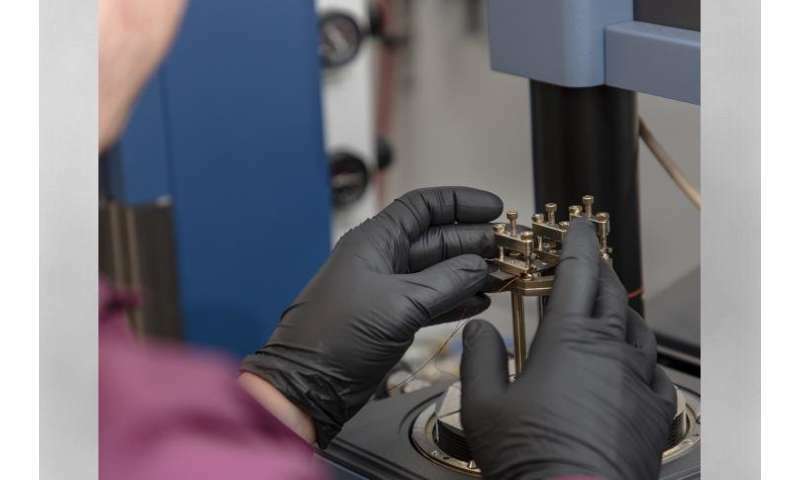 ORNL postdoctoral fellow Ngoc Nguyen conducted additional tests in a Fourier-transform infrared spectrometer to study chemical bonds within the composites and improve understanding of the enhanced mechanical strength that was observed. "Dip coating offers a new route to utilize novel nanomaterials under development," Bowland said. The title of the paper is "Roll-to-Roll Processing of Silicon Carbide Nanoparticle-Deposited Carbon Fiber for Multifunctional Composites."